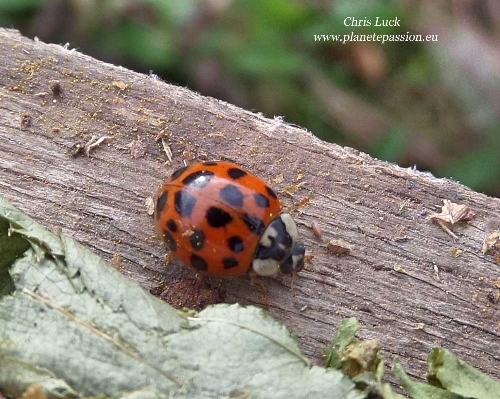 Every year in autumn and spring there are articles in the media, especially in the UK, about the Asian Ladybird, Harmonia axyridis, or Harlequin Ladybird as it is known, one of several thousand different non native species introduced in both France and the UK although only a few are ladybirds. 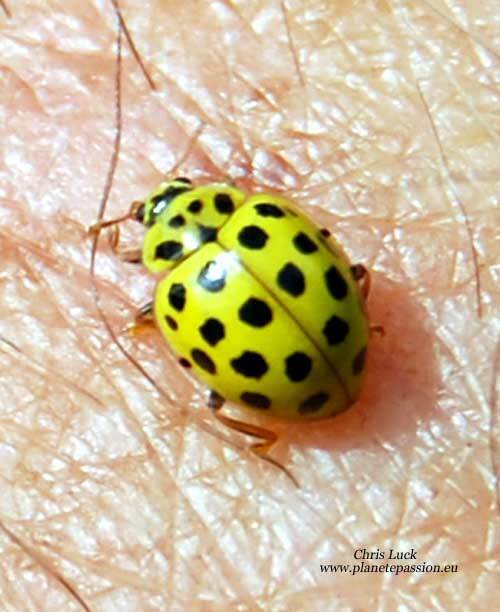 This species is generally regarded as the most invasive ladybird on Earth and although they undoubtedly have an environmental impact due to their high breeding and survival rate combined with their voracious appetite most experts are of the opinion that they are now so abundant that there is little if any point in killing them. 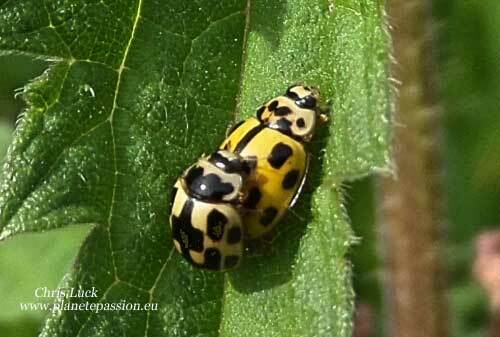 Above - 2 examples of Harlequin Ladybirds. They are extremely variable but most have a clearly defined "M" or "W" on the pronotum. 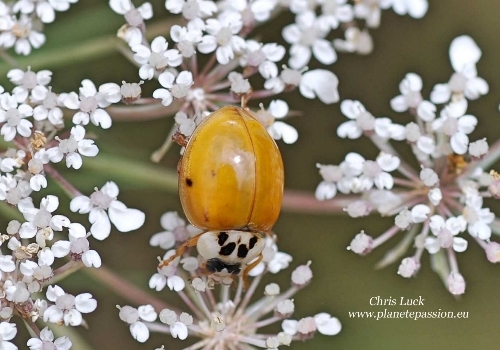 Although they feed most commonly on aphids they have a wide food range that includes scale insects, adelgids, the eggs and larvae of butterflies and moths, many other small insects including other ladybirds, pollen, nectar, and sugary fluids, including honeydew and the juice from ripe fruits bringing them into direct competition with native species of Ladybird many of which are already under pressure resulting from all the usual reasons, habitat loss and pesticide use being uppermost. The risk as always that comes from articles in the media and the consequent sharing on social media is that some people will unwittingly start killing anything that they don’t recognise as the stereotypical image of a Ladybird, generally the most common of which is the Red and Black spotted 7 spot ladybird, and there are too many people already locked into a “kill everything that isn’t a butterfly” mode of thinking. 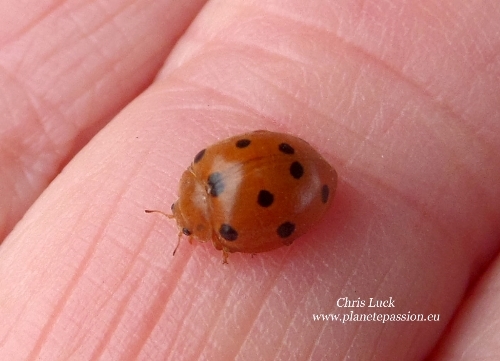 To move on, there are 90 or more species of native Ladybird in France most of which wouldn’t be recognised as such. Some are brown, some black, some yellow and black, some black and red, some orange and perhaps not surprisingly many are highly selective about where they live and what they eat with many being vegetarian. It would be difficult here to include that number of native species, so I have listed a few here to give some idea of just how different they are. 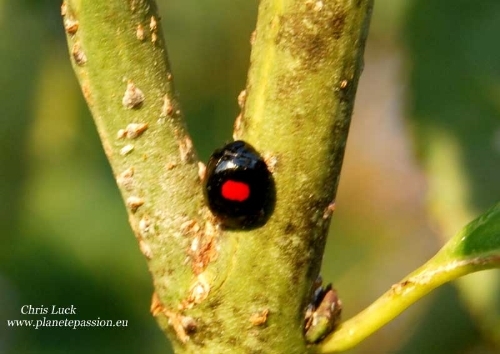 Above: Kidney-spot ladybird (Chilocorus renipustulatus) Black body with large red spot on each wing case, feeds on scale insects on the bark of trees. 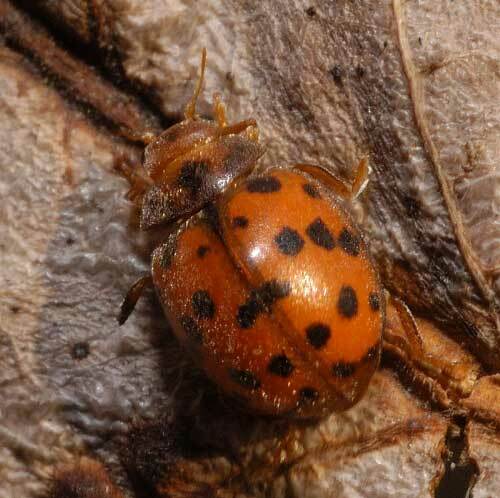 Above: Pine ladybird (Exochomus 4-pustulatus) Usually elytra are black with two larger red comma-shaped spots and two smaller red round or oval spots, feeds on aphids and scale insects. 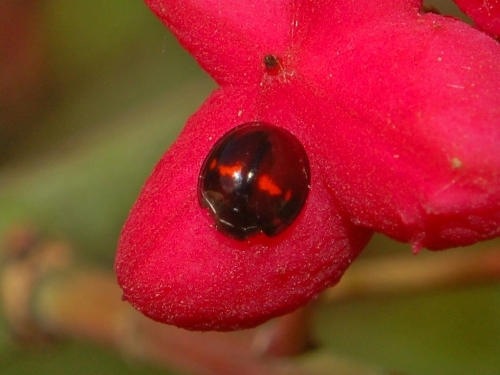 Above: Heather ladybird (Chilocorus 2-pustulatus) Black with 2 to 6 red spots feeds on scale insects. 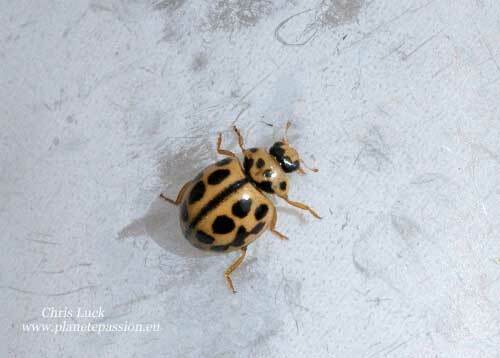 Above: 16-spot ladybird (Tytthaspis 16-punctata) Beige with black spots. 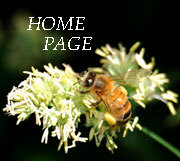 Feeds on Aphids, Pollen, nectar and fungi. Can overwinter in large numbers, 50 or more in one cluster. 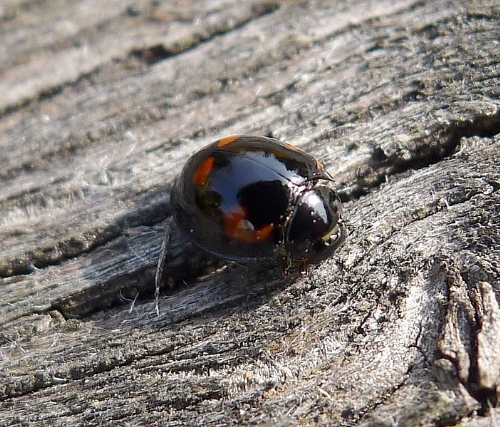 Above: 24 spot ladybird (Subcoccinella vigintiquattuorpunctata) Sometimes known as the Alfalfa Ladybird. Orange –red, number of spots may vary. Feeds on a variety of plants including Campions, vetches, trefoils, chickweed and plantains among others. They will also take grasses and inFrance can be a pest of lucerne. 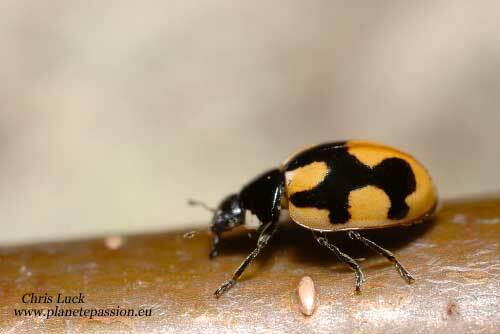 Above: Hieroglyphic ladybird (Coccinella hieroglyphica) brown or black with black stripes, spots and patches. Feeds on larvae of Heather leaf beetle. 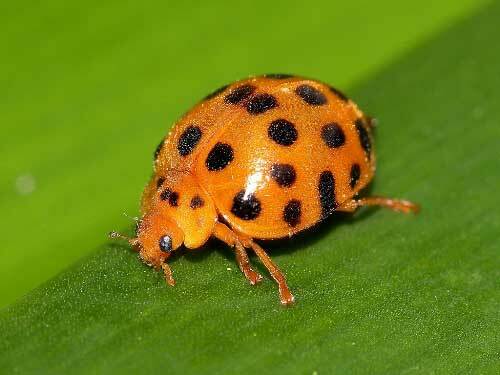 Above: Bryony ladybird (Henosepilachna argus) Orange red with 11 black spots. Feeds on White bryony and plants of the Melon family. 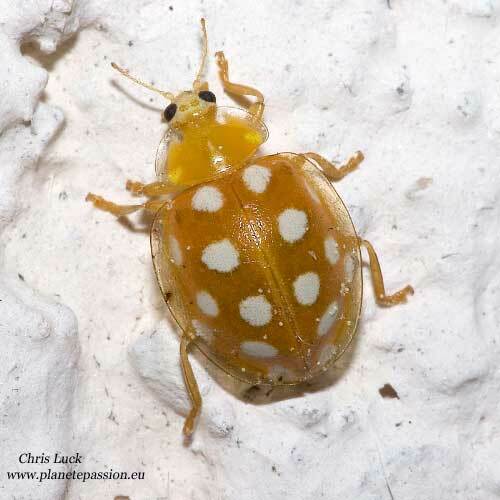 Above: 28-spotted potato ladybird (Henosepilachna vigintioctopunctata)Orange with 28 spots feeds on the foliage of potatoes and other solanaceous crops.